So, you’ve studied Japanese for the right amount of study hours you need for the big test. You’ve gone over the kanji and vocabulary, even mastered all the grammar and phrases you need for the test. You’ve even done some Japanese reading to help you build up stamina and speed reading skills. You’re thinking to yourself, I’m ready for this thing, but you are missing out on one small, but crucial step, taking a practice or mock test. As the old saying goes “practice makes perfect.” As for the JLPT, practicing how to answer the questions can give you a big boost. Simply knowing what they will look like and what traps to look out for can mean the difference between a few percentage points and you might need those to pass the test. It’s definitely worth the small amount of extra time it takes to go through a practice test so that you’ll be ready for the real thing. By the way, this particular article covers the JLPT N4, but if you are studying for the N5, I also have a JLPT N5 Practice Test available. The kanji and vocabulary sections are very similar to the new test, the grammar section has added the scrambled sentences, and the reading and listening sections are slightly different as well. One small note, you can find previous tests on the web, but keep in mind that they sometimes have spelling mistakes, usually have at least a few incorrect answers and the listening quality is shoddy at best. I guess you get what you pay for. 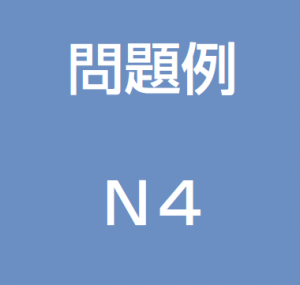 The second option for practicing the JLPT is to get a JLPT N4 mock test. Mock tests are created by third party companies and are meant to imitate the test. They are usually pretty dead on for predicting how hard the real test is going to be and they are also in the exact same format as the real test, so taking a mock test would probably give you the best boost overall. I’ve always taken a mock test before the real exam and it helps me prepare mentally for the exam. If you’d prefer the clean version, you can get that here. This is the listening for the practice test. Unfortunately, the audio only includes the first question of every section along with the instructions, but the script has all the questions go figure. Anyway, if you’d like to play it from your computer, be sure to right-click and click ‘save link as…’ or something similar. There is also a listening script to help you look up anything you might have missed while listening. This is the official answer sheet for the practice test so you can practice filling in the answers at lightening fast speeds. All the answers to the questions. Here are some Anki flashcards that I made for the first 14 questions. After the first 14, there are text grammar and reading questions which can’t really be easily put into Anki. You can either add this to your personal deck or study them on their own. You can also download them off AnkiWeb by searching for “N4 Practice Test Questions”. Take the JLPT N4 Sample Test. How was it? What was the most difficult part? Let me know in the comments below. I hope to hear from you soon! Thanks a lot for putting these files up, and organizing them so well too. Really appreciate it! No problems, hope it helps you study for the test! Typo in the first sentence: Should be “right” amount. I go over briefly how many questions are on each section of the test along with how much time you should spend on each section in my JLPT time management article. Hopefully that should give you an idea about how to plan for the test. The audio file did not include the dialog for all of the questions. Yeah, it only includes one question from each section doesn’t it? A double-checked the JEES website and this is all they have. That’s a bit strange. Sorry, for the mix up, I’ll correct the article. Help! I’ve just got hold of the Unicom Preparatory course for the old Level 3 and it’s entirely in Japanese – no helpful commentary or explanations. I’ve been to their website and they have nice new editions for the other levels but leave out this one! I wonder why they haven’t done an N4 – I found the N5 really helpful. Not sure what to do with the book. Think I’ll have to just use my Complete Masters Series book along with my textbooks. What do you think? Hmm, actually I’m not too familiar with the Unicom series of books. I think I’ve seen them before though. Are they the smaller books with the steps on them? I’m also not entirely sure about complete masters series either. Are you talking about Tanki Master? Ahh, the old kanzen master book for 三級 yeah, I have that exact same book and it was pretty much THE book I used to pass 三級. It is an incredibly good little book that went out of print :(. I’m not a big fan of the all-Japanese explanation of grammar until at least N2 and even then it is a little iffy. You do need to think in Japanese to improve fluency and such, but you also need to make sure you clearly understand the concept too. this is a really helpful resource. i am far better at writing and reading than i am listening or (god save me) talking. now i have a good idea of which level i might aim for. thanks! You’d probably surprise yourself with how well you can speak. I’d give it try. Anyway good luck on the test! I think the N4 covers about 300 kanji and that’s it. Not the kanji for all the words on the lists available on the net. But, of course it is useful to know the kanji for real use.